see the article “Victorian Virtual Reality” in Manitoba History volume 54, February 2007.
was made possible by a grant from the Winnipeg Foundation. I love historical photographs. But the vast majority of them leave me feeling, well, flat. I look at the world around me, and the slightly different versions seen by my two eyes are merged by my brain into a three-dimensional image that permits me to gauge distance. Yet most photographs are taken with a single camera, akin to the view from one eye. No wonder they cannot show me anything approaching reality as most of us experience it. circa 1901. The original pair of photographs was converted to this anaglyph. 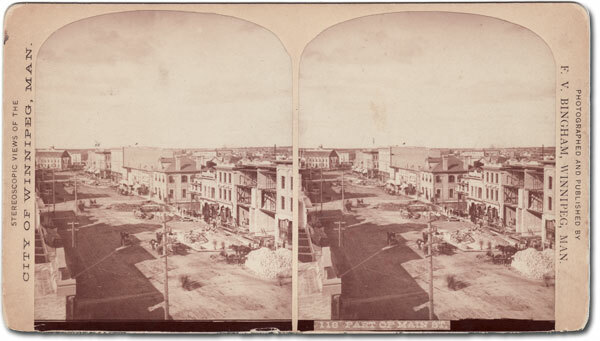 Manitoba’s first stereoviews were created by the Boundary Commission of 1872-74, during which the line separating prairie Canada from the USA was defined. A remarkable three-dimensional image shows two men, seated in front of their tent beside a Red River Cart, preparing chemicals and sheets of glass for use in the “wet plate” photographic process of the time. The earliest resident stereographer (a photographer who takes stereoviews) in Manitoba was probably Simon Duffin (1843-1900). Duffin sold his Ontario general store in 1872, bought a mobile photographic caravan, and headed west. Arriving in Winnipeg in 1873, he began offering a wide variety of “views of Winnipeg, Manitoba, and the North-West,” including residences and businesses as well as landscape photography. 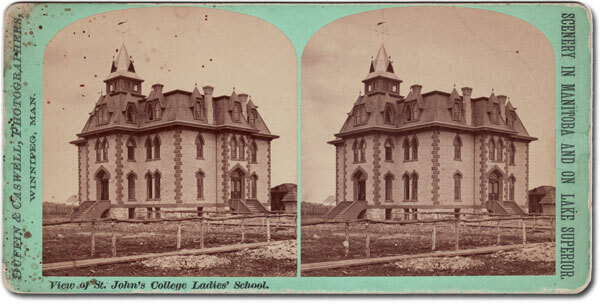 Among Duffin’s stereoviews were the passenger cabin of the steamer City of Winnipeg on the Red River, the St. John’s College Ladies’ School, and an early Main Street scene. Several more stereographers arrived in 1881, along with the Canadian Pacific Railway. They included Fred V. Bingham, F. Jay Haynes, and A. B. Thom. Haynes took 92 stereoviews during a single visit  while Bingham and Thom took a wide range of views—alone or in a short-lived partnership with each other—over a period of two or three years. They took stereoviews in Winnipeg, Emerson, and probably other places. Bingham’s views of street scenes and buildings are unique, and are frequently published as single photographs. Both men also followed the railway as it advanced across the prairies and into the mountains, taking outstanding three-dimensional panoramas along the way. Surprisingly, no other photographers seemed to have followed their lead, with the result that few stereoviews survive from the late 1880s and 1890s. By the early twentieth century, stereoviews had become mass-produced commodities marketed by large companies such as the Keystone View Company, Underwood & Underwood, and the H. C. White Company. Winnipeg’s Canadian Stereo-Photo Company tried to share in the business but was unable to match the overwhelming market supremacy of American competitors, and quickly closed its doors. Stereoviews were sold, individually and in collections, in photographic studios and bookstores. Eaton’s department store in Winnipeg stocked stereoviews, including the steamer Winnitoba on the Red River, a bison paddock, skyline views around the city, buildings and the railway depot at Winnipeg Beach, and a pastoral view of an old country bridge at Starbuck. Meanwhile, amateurs were getting into the act. The development of simple-to-use cameras led to a growing number of amateur stereographers. Lacking the compositional skill of professionals, their images were typically poor but there were occasional exceptions, such as those taken by Edgar J. 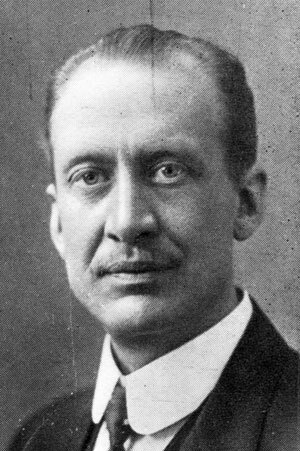 Ransom (1874-1956). 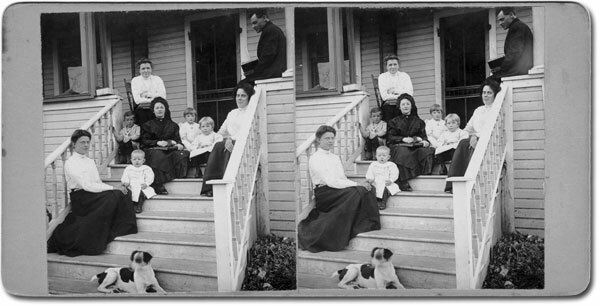 Ransom’s profession as an artist, printer, and engraver probably helped in his creation of excellent stereoviews of day-to-day family life in the 1910s. Source: Archives of Manitoba, Personalities - Ransom, E. J. The stereography craze had largely petered out by the 1930s. The rise of radio and talking movies around the same time was not a coincidence; they provided an experience that was perhaps more realistic than static and silent stereoviews. But interest in stereoscopy did not die; indeed, the paper “View-Master” disks containing small stereoscopic images appeared in the 1940s, were very popular in the 1950s and ’60, and are still sold today. A small number of dedicated stereographers still push the innovation envelope using color imagery, digital cameras, and computer software. Stereoviews were the first visual “mass medium” and they exposed vast numbers of people to the world around them, from current events and celebrities, to the battlefield horrors of the American Civil War, to the natural wonders of land and water, to exotic and foreign cultures that few people could experience first-hand. Remarkably, the majority of Manitoba stereoviews come to us from the late 1870s and early 1880s; most later views were taken by non-resident photographers employed by publishing companies. 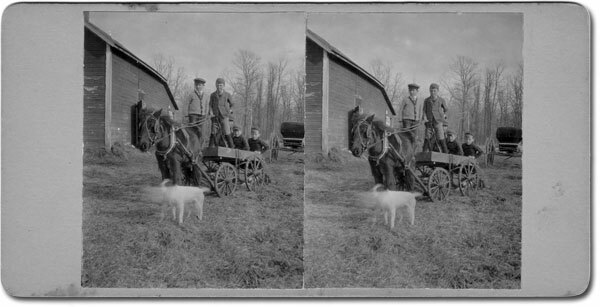 Manitoba stereoviews are scarce as compared to those taken in Ontario, Quebec, and other places settled earlier, by more people. The Archives of Manitoba has a small collection, but some archives in the province have none. Perhaps the complex equipment (usually, two synchronized cameras) and ideal composition needed to achieve acceptable stereoscopic effect was too onerous or insufficiently remunerative for our few stereographers. Or perhaps there are few here in Manitoba because their primary role was not to edify the locals but to convince relatives and potential immigrants that Manitoba was a place worth visiting, worth living in. If so, the surviving Manitoba stereoviews may have been sent around the world as agents of propaganda. Only now that the Internet provides a global marketplace can we repatriate some of these incredible photographs. Enjoy the views. 1. Manitoba Free Press, 8 January 1875. 2. David Mattison, “A fair collection of views: F. J. Haynes in Canada, 1881.” Photographic Canadiana, January/February 1998. 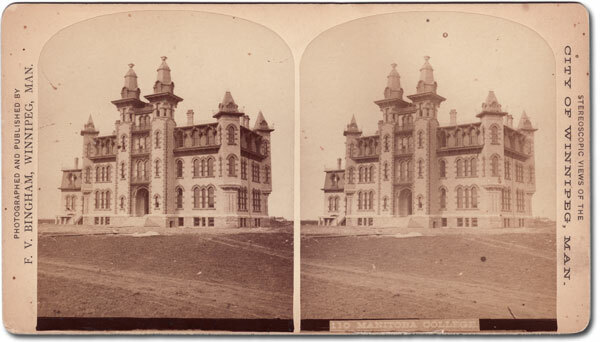 The stereoviews in this feature can be viewed without a stereoscope by training one’s eyes to “free-view.” Position the paired images 30 to 40 cm from your eyes, looking above and beyond them, and keep focused there. Then raise the images into your line of sight and they will, at first, give three images which should eventually melt into a single image in the center - in 3D. Free-viewing takes practice. Despite what your Mom told you, crossing your eyes in this way will not make them stay that way. There is a easier way to enjoy stereoviews without recourse to free-viewing or antique stereoscopes. The paired photographs were scanned as color images. Using Adobe Photoshop software, the red layer of the left image was overlaid on the green and blue layers of the right image. This combined image is called an anaglyph. 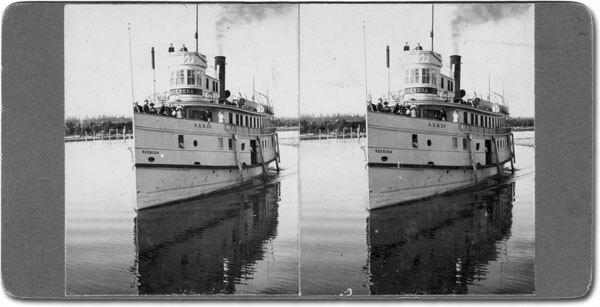 Click here for information on creating anaglyphs from stereoviews. Use a pair of red-blue lenses to see the anaglyphs. Hold its tab in your right hand so the red lens covers your left eye and blue lens covers your right eye. The stereoscopic effect is more pronounced in some anaglyphs than others, and “ghosts” are common at the edges and background of most images. Click each stereoview to see an anaglyph version in a separate window. developing chemicals next to their tent and Red River Cart, circa 1872. Source: Archives of Manitoba, Boundary Commission 135. 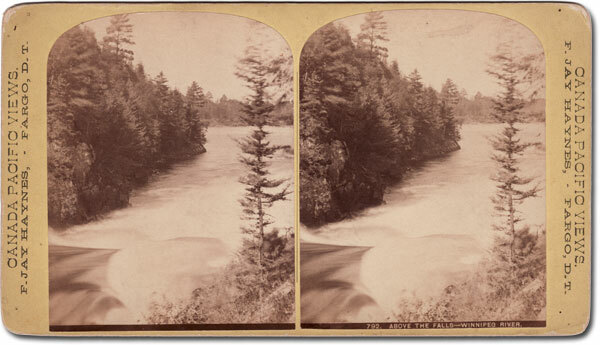 This is an example of a stereoview which, when seen in a stereoscope or free-viewed, gives a good stereoscopic effect. However, for reasons that elude me, it does not convert into a good anaglyph: the three-dimensionality is barely perceptible. We had planned to use it for the cover of Manitoba History number 54 but dropped it at the last moment for this reason. Source: Archives of Manitoba, St John’s Ladies College 6. This view apparently shows Western Canada’s first college for women, whose predecessor building was constructed in 1826 or 1827. Like many things about Winnipeg in the 1870s, the building appears newly constructed. 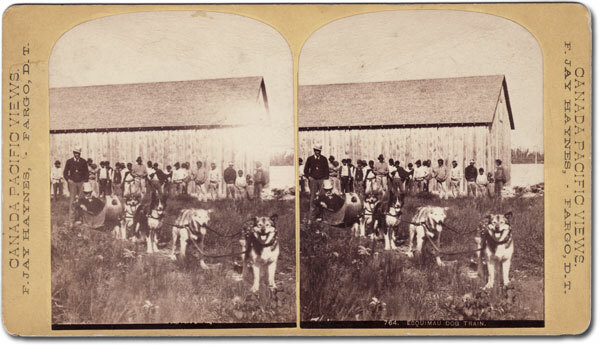 Dog team and cariole, stereoview by F. Jay Haynes. Source: Archives of Manitoba, Keewatin 2, N13748. During his short stay in Manitoba at the invitation of the Canadian Pacific Railway, American photographer Haynes boarded the S.S. Colvile for a seven-day trip around Lake Winnipeg. The HBC post at Barren’s River was one of the ship’s ports of call, and Haynes probably this view there. Sitting in a sleigh, pretending to be drawn by dogs, was apparently popular, for Haynes took two photographs of people doing it. 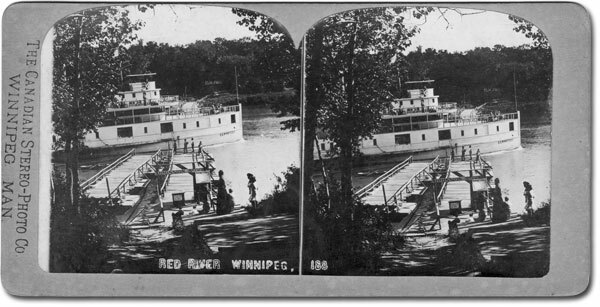 Returning to Winnipeg, Haynes then proceeded to the communities of Keewatin and Rat Portage (now amalgamated as Kenora, Ontario) to view the lumber operations. After travelling around Lake Winnipeg on the Colvile, F. Jay Haynes traveled to Keewatin and Rat Portage (now Kenora, Ontario) to view the lumber operations there, then returned to Manitoba where he headed west on the new CPR railway to the end of tracks west of Portage la Prairie. From there he continued west by horse and buggy, passing the new town of Brandon, the old HBC post at Fort Ellice, and eventually ending his tour at Fort Qu'Appelle. He took over 90 stereoviews along his route, and many of these incredible images are retained at the Montana Historical Society in Helena. 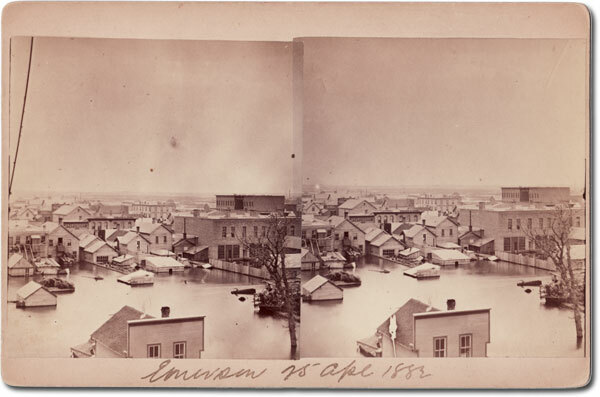 The bustling town of Emerson was hit with a catastrophic flood, seen in this view from 25 April 1882. Source: Archives of Manitoba, Emerson 63, N16080. 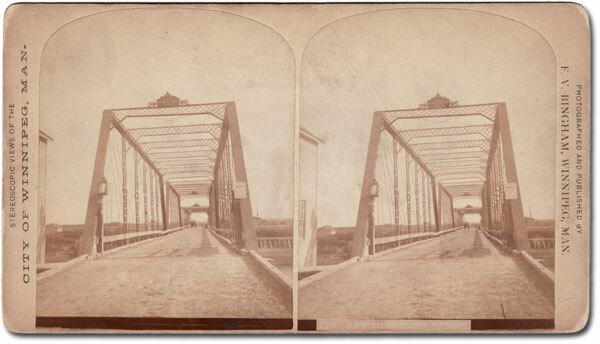 The photographer of this stereoview is not identified but perhaps was Fred V. Bingham, who took other views of the town around the same time. The stereoscopie effect is most visible in the building and tree in the foreground. The image itself is faded but the contrast can be improved considerably with Adobe Photoshop. The stereoscopic effect is quite pronounced. Notice the people standing at the far end of the bridge. Source: Archives of Manitoba, Manitoba College 5-1, N10851. Manitoba College was founded in 1871 at Winnipeg by the Reverend George Bryce, a co-founder of the Manitoba Historical Society. Affiliated with the Presbyterian church in Manitoba, the college was one of the founding colleges that made up the University of Manitoba. Later, it later merged (in 1938) with the Methodist’s Wesley College to form United College, precursor of the University of Winnipeg. This interesting building is one of many around the city that has been demolished in the name of “progress.” Being so far back in the photo, the stereoscopic effect of the building itself is mild, mostly detectible in the bare soil in front of it. 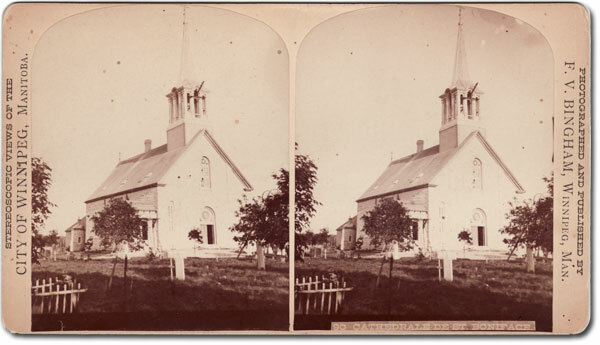 Source: Archives of Manitoba, St. Boniface Cathedral (1863) - 13. The present church is at least the fourth on the site, on the east bank of the Red River. The first was built of logs by J. N. Provencher in 1818 and replaced soon after by a larger structure. When Provencher became a bishop in 1822, his church became a cathedral. A more substantial cathedral was built in 1832, but it burned in 1860, and its replacement shown above was built in 1862 by A. A. Taché. To meet the needs of a growing Francophone community in the West, an even larger church replaced it between 1905 and 1908. The St. Boniface Basilica burned on 22 July 1968, but a new cathedral was built within its ruins in the early 1970s. Source: Archives of Manitoba, Winnipeg - Streets - 1882 - 2. Winnipeg boomed with the arrival of the Canadian Pacific Railway in 1881. Despite active construction, seen in this view of Main Street, numerous people lived in tents and land speculation was rampant. Inevitably, the boom bubble burst but fortunes were made in the meantime. The events of this period were described by MHS founder Charles Napier Bell in an article published in Manitoba History number 53 (October 2006). 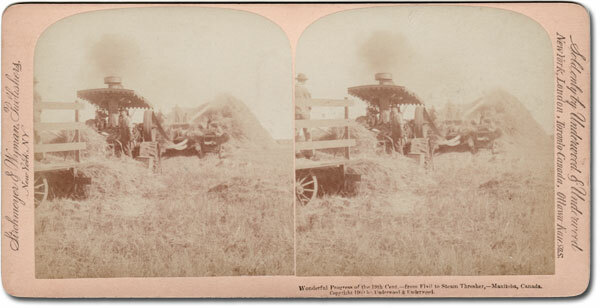 A Manitoba farmer threshes his crop, circa 1900, in this stereoview sold by Underwood & Underwood, published by Strohmeyer & Wyman of New York City. The S.S. Winnitoba passes the pontoon bridge over the Red River leading to Elm Park, circa 1910. The Winnitoba was capable of carrying 2,000 passengers and 35 carloads of freight. It later burned at the Highland Park dock. This card carries the imprint of the Canadian Stereo-Photo Company but the same image was also sold under the Eaton’s department store imprint, a copy of which is contained in the photograph collections of Dalnavert Museum. Railway cars in the Winnipeg switching yard of the Canadian Pacific Railway. With the arrival of the Canadian Pacific Railway in the early 1880s, Winnipeg became the transportation hub of Western Canada. Huge amount of cargo passed through the city to points east and west. 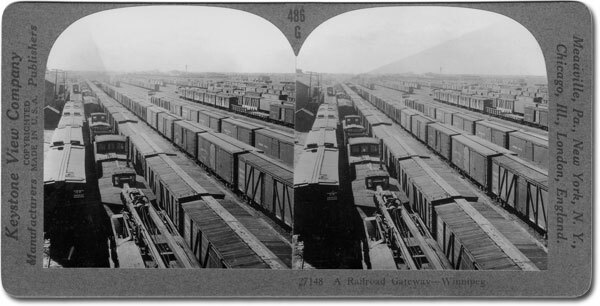 The CPR switching yards in the north end formed a symbolic barrier as well as a physical one; people north of the tracks were generally (but not always) “blue collar” working class whereas those south of the tracks were often (but not always) “white collar.” The stereoscopic effect in this early 20th century image from the Keystone View Company is subtle, and there is some kind of distortion in the upper left corner - perhaps the effect of sunlight on the camera lens. 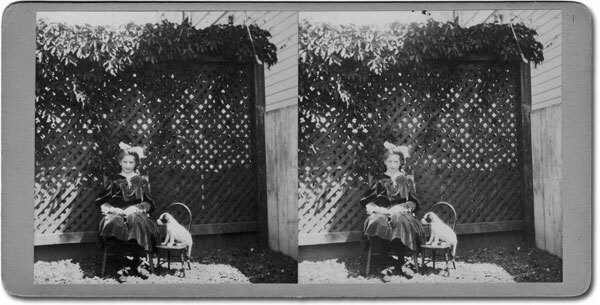 Della Lemon (1894-1977) relaxes with her puppy in the back yard of her home at 420 Edmonton Street in Winnipeg, circa 1905. Source: Archives of Manitoba, Della Louise Lemon Collection, photograph #400. Della was born in Winnipeg to Joseph Lemon (1862-1925) and Margaret McMullen (1866-1956), along with brother Ewart Roy (1889-1908). Miss Lemon retained a large collection of materials amassed by her family during their lives, much of which was salvaged by Randy Rostecki and others when the family residence was demolished to make way for an apartment block. They were subsequently donated to the Archives of Manitoba by Rostecki and Rosemary Malaher on behalf of the Manitoba Historical Society. Among the materials were some stereoviews, probably taken by Joseph Lemon. Most of them were poorly composoed so the stereoscopic effect is not pronounced. 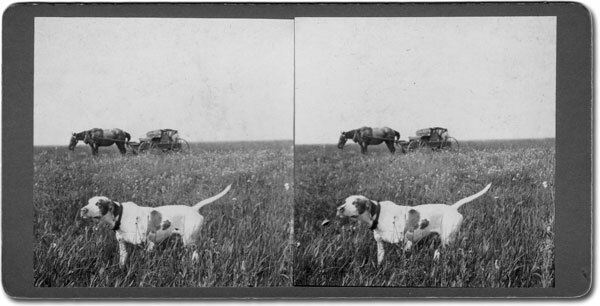 Dog on the prairie, with horse-drawn buggy in the background. Source: Archives of Manitoba, Della Louise Lemon Collection, photograph #403. Della’s father Joseph Lemon was an active sportsman, owning property at Delta Marsh where he hunted waterfowl each fall. He also hunted prairie birds, for which he bred retriever dogs like this one. 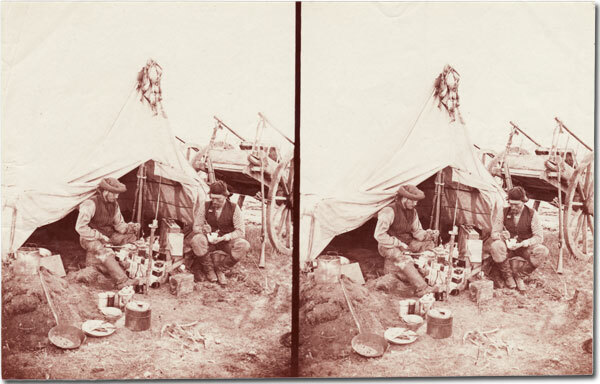 This stereoview was probably taken around 1905 when Lemon was on a hunting trip. Like his other views, the composition does not lend itself to a marked stereoscopic effect. S. S. Keenora, circa 1910 . Source: Archives of Manitoba, Edgar J. Ransom Collection, #481. This passenger and freight steamship is the oldest vessel on display at the Maritime Museum of Manitoba, located in Selkirk. It once operated on Lake of the Woods, the Red River, and Lake Winnipeg. Horse and wagon with unidentified children, circa 1910. Source: Archives of Manitoba, Edgar J. Ransom Collection, #482. Photography in its early days required long exposures so movement was forbidden. This must have posed significant challenges for photographers of children and animals, as shown by this view by amateur photographer Edgar Ransom. The children were more cooperative than the dog in the foreground. 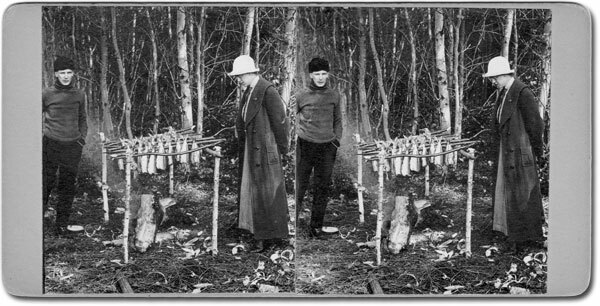 H. C. Harman (left) smokes fish over a fire with Jessie Ransom, possibly at Minaki. Source: Archives of Manitoba, Edgar J. Ransom Collection, #484. Many photographs in the Edgar Ransom collection show his younger sister Jessie, who lived in Winnipeg for many years and later married engineer Bob Oldham. Harman must have been a friend, as he appears in outdoor shots of fishing expeditions like this one. Jessie Ransom (front), Fanny Ransom (top), Catherine Saunders (right), rest unidentified, circa 1910. Source: Archives of Manitoba, Edgar J. Ransom Collection, #493. © 2007 Gordon Goldsborough & Manitoba Historical Society.